What types of law enforcement officers could I encounter at the airport and at the border? If I am entering the U.S. with valid travel papers, can law enforcement officers stop and search me? Can law enforcement officers ask questions about my immigration status? Can U.S. customs officers ask questions about my religious beliefs and practices or political opinions? Do I have to provide my fingerprints? If I am selected for a longer interview when I am coming into the United States, what can I do? Do I have to provide my laptop passwords or unlock my mobile phone for law enforcement officers? Can my bags or I be searched after going through metal detectors with no problem or after security sees that my bags do not contain a weapon? What if I wear a religious head covering and I am selected by airport security officials for additional screening? What if I am selected for a strip search? What if I am traveling with children? What if I am traveling with breast milk or formula? If I am on an airplane, can an airline employee interrogate me or ask me to get off the plane? What do I do if I am questioned by law enforcement officers every time I travel by air and I believe I am on a “no-fly” or other “national security” list? Can Border Agents Search Your Electronic Devices? What to do if you think you're on the No Fly List? You may encounter any of the full range of law enforcement officers listed in Section I under “Related Information” at the bottom of this dropdown. In particular, at airports and at the border, you are likely to encounter Customs and Border Protection officers (CBP) and Transportation Security Administration (TSA) officers. Generally, customs officers may stop, detain, and search any person or item at the border. This is true even if there is nothing suspicious about you or your luggage. The government believes this authority to search without individualized suspicion extends to searches of electronic devices such as laptops and cell phones, but that is a contested legal issue. Officers, however, may not select you for a personal search or secondary inspection based on your religion, race, national origin, gender, ethnicity, or political beliefs. Customs officers have the authority to ask your immigration status when you are entering or returning to the United States or leaving the country. They have the power to determine whether non-U.S. citizens and lawful permanent residents have the right to enter the country. If you are a U.S. citizen and you have presented a valid passport, you do not have to answer officers’ questions, although refusing to answer routine questions about the nature and purpose of your travel could result in delay and/or further inspection. If you are a lawful permanent resident, we recommend you answer officers’ questions. If you are a non-citizen visa holder, you may be denied entry into the United States if you refuse to answer officers’ questions. Officers, however, may not select you for questioning based on your religion, race, national origin, gender, ethnicity, or political beliefs. If you are told you cannot enter the country and you fear you might be persecuted or tortured if you are sent back to the country from which you traveled, you may tell the customs officer about your fear and ask for asylum. Religious and political beliefs, associations, and practices are protected by the First Amendment. Customs officers have sometimes asked travelers about their religious affiliation, religious practices, association with religious institutions, and political opinions. The travelers targeted for such questioning have often been Muslim. Questioning individuals about their religious and political beliefs, associations, and practices can infringe upon rights guaranteed by the Constitution and federal law — these rights are not surrendered at the border. If you are a U.S. citizen or lawful permanent resident, you do not have to answer questions about your religious beliefs and practices or political opinions, and you cannot be denied entry to the United States for declining to answer such questions. If customs officers persist in asking you such questions, you can request to see a supervisor. If you are a non-citizen visa holder, you may decline to answer general questions about your religious beliefs and political opinions, but doing so may lead to delay or additional questioning, or possibly denial of your entry into the country. If you are told you cannot enter the country and you fear you might be persecuted or tortured if you are sent back to the country from which you traveled, you may tell the customs officer about your fear and ask for asylum. All visitors and lawful permanent residents are fingerprinted on entry into the United States from abroad. U.S. citizens have the right to enter the United States, so if you are a U.S. citizen and the officers’ questions become intrusive, you can decline to answer those questions, but you should be aware that doing so may result in delay and/or further inspection. Lawful permanent residents may face additional risks for declining to answer questions, and non-citizen visa holders may be denied entry for refusing to answer officers’ questions. If the officers’ questions become intrusive or improper, you should complain and ask to speak to a supervisor. (This goes for citizens, lawful permanent residents, or non-citizen visa holders.) Although CBP takes the position that you are not entitled to an attorney during primary and secondary inspection, we encourage you to have the telephone number of an attorney or legal services organization with you and ask to contact them if you feel your rights are being violated or if you have been detained for an unusually long period. For anyone attempting to enter the United States, if a customs officer or border agent informs you that you are under arrest, or if it becomes clear that he or she suspects you have committed a crime, you should ask to speak to a lawyer before answering any further questions. Officers have sometimes asked travelers to provide their laptop passwords or unlock their mobile phones. Whether you have a right to decline to provide this information is a contested legal issue. The extent to which officers have the authority to search or copy files in your electronic devices without any reasonable suspicion that the devices contain evidence of wrongdoing is also a contested issue. U.S. citizens cannot be denied entry to the United States for refusing to provide passwords or unlock devices, but refusal to do so might lead to delay, lengthy questioning, and/or officers seizing your device for further inspection. For lawful permanent residents and non-citizen visa holders, refusing to cooperate might also lead to officers denying your entry into the country. If an officer searches and/or confiscates your laptop or cell phone, write down his or her name and get a receipt for your property. Yes. Even if the initial screen of your bags reveals nothing suspicious, the screeners have the authority to conduct a further search of you or your bags. Screeners may not, however, select you for a personal search or secondary inspection based on your religion, race, national origin, gender, ethnicity, or political beliefs. You have the right to wear your religious head covering. You should assert your right to wear your religious head covering if asked to remove it before going through airport security screening. 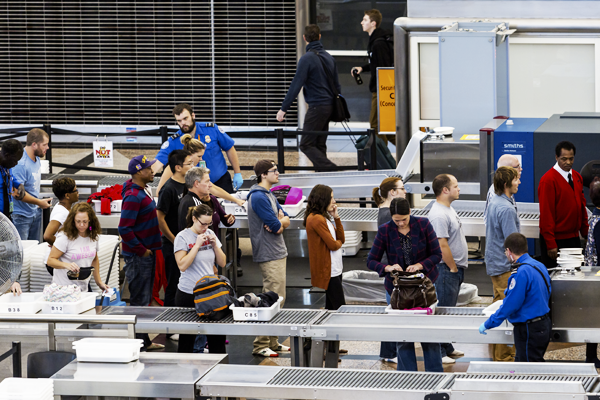 If an alarm goes off, however, airport security officers may request additional screening. They may then conduct a pat-down of your religious head covering or ask you to remove it. You have the right to request that the pat-down or removal be conducted by a person of your gender and that it occurs in a private area. If you do not want the TSA officer to touch your religious head covering, you must refuse and say that you would prefer to pat down your own religious head covering. You will then be taken aside and a TSA officer will supervise you as you pat down your religious head covering. After the pat-down, the TSA officer may rub your hands with a small cotton cloth and place it in a machine to test for chemical residue. If you pass this chemical residue test, you should be allowed to proceed to your flight. If the TSA officer insists on the removal of your religious head covering, you have a right to ask that it be done in a private area. Officers may not conduct additional screening based solely on your race, national origin, religion, gender, ethnicity, or political beliefs. A strip search at the border is not a routine search. It must be supported by “reasonable suspicion,” and must be done in a private area. You may opt your children out of an airport scan. However, there is no exemption for children from the pat-down search. Children under 13 years old may leave their shoes, light jackets, and headwear on during screening. Mothers flying with and without children are permitted to bring breast milk and formula (and ice packs or other accessories required to cool the breast milk or formula) in quantities greater than three ounces, as long as you notify the officers about the items at the security checkpoint. When carrying breast milk or formula through the checkpoint, they will be inspected. TSA officials may test the liquids for explosives. TSA officials may ask you to open the containers during the screening process. Breast milk and formula, along with other liquids and gels, may also be packed in your luggage and checked with your airline. An airline pilot may refuse to fly a passenger if he or she reasonably believes, based on observation, that the passenger is a threat to flight safety. A pilot may not, however, question you or refuse to allow you on a flight because of biased stereotypes, including any based on your religion, race, national origin, gender, ethnicity, or political beliefs. If you believe you are mistakenly on a list, you should contact the TSA and file an inquiry using the Traveler Redress Inquiry Process. More information is available here. If you think there may be some legitimate reason for why you have been placed on a list, you should seek the advice of an attorney.